At this time, every year, it seems we’re either celebrating or bemoaning the arrival of another reboot of a vintage classic every weekend. Star Trek Beyond, Ghostbusters, Tarzan and Independence Day: Resurgence have been duking it out at the box office but new versions of Akira, Big Trouble in Little China, The Birds, The Crow, Death Wish and Escape From New York are all in the works as we speak. One studio that certainly has the potential to do it better than most is Disney. With a long and storied history of beloved movies behind it, it’s planning live action remakes of Pinocchio, Beauty and the Beast, Dumbo and Mulan, to name just a few. Next cab off the rank is one that’s not remembered quite as much among the classics but makes perfect sense today because of the technical potential – Pete’s Dragon. 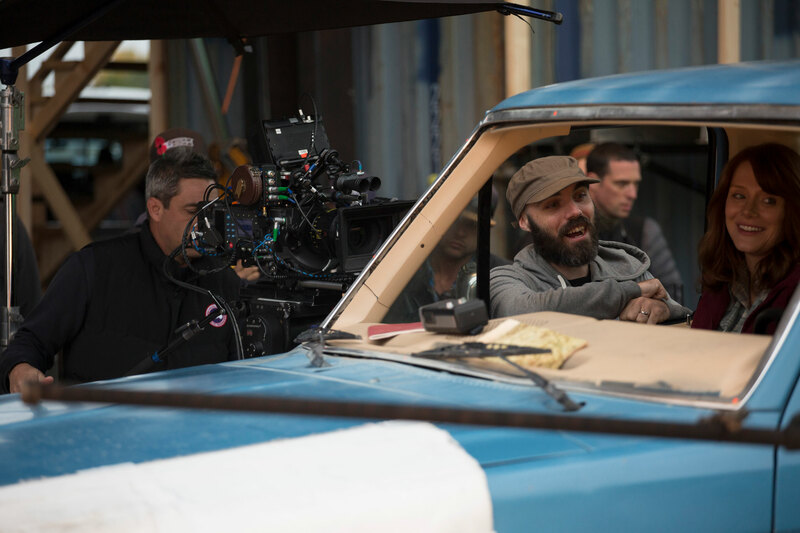 David Lowery directing Bryce Dallas Howard on the set of ‘Pete’s Dragon’. The blend of live action and animation was as charming as it was ground-breaking back in 1977, but CGI means almost every movie on screens has such wizardry these days. Dragons are also far more a pop culture fixture today than they were back when the original came out, so Disney is obviously hoping the titular creature will be a hot property. 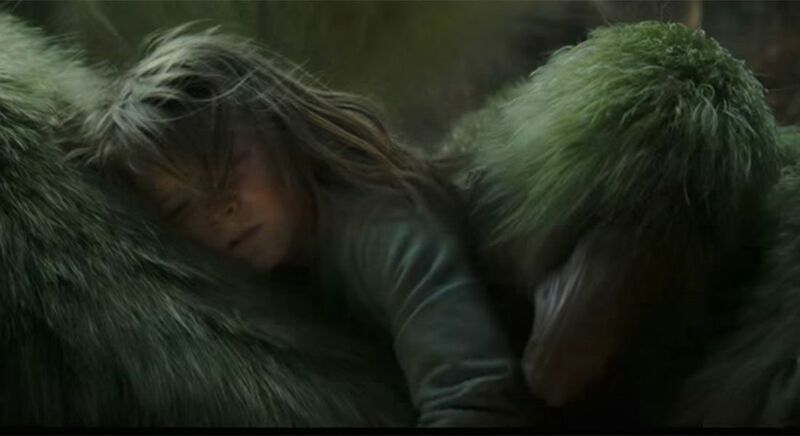 In between preparing for the big live action Peter Pan redux, Pete’s Dragon director David Lowery showed Video & Filmmaker some select scenes from the film that show Elliott the dragon in full glory, then told us what convinced him to do the film and whether ‘peak dragon’ might hurt its success. TELL US ABOUT THE SCENE OF PETE AND ELLIOT SPLASHING TOGETHER IN THE RIVER? That was the very first day of principal photography. There was a river nearby [the set was located in rural New Zealand], so we decided to go out and shoot the stuff in the river so we could get it out of the way. That was Oakes’ [Fegley, who plays Pete] first day getting to interact with something that wasn’t there and it was the first time I realised ‘man, he is really good at this’. Just splashing around, half that stuff he did was improvised. I’d just be saying ‘okay, just be running around, act like you’re getting splashed’. A big part of the movie was letting him just interact by pretending it was and watching what he did. As far as the water, it’s entirely his performance that sells it. All the water that gets added because of the dragon is digital. It was also the very first digital effects work since we shot that scene early on. It was our first look at what the dragon would look like or how he would feel, the type of weight he would have and so on. Pete falls asleep on the back of the dragon Elliot. HOW MANY DESIGNS FOR ELLIOT DID YOU GO THROUGH? We went through very few designs. I mean, we went through a lot but I had drawn a picture of what I wanted him to look like. We went through a process of letting other designers take a crack at it but ultimately it ended up back where that original design was. But we had a great group of designers who made my amateur sketch look like a real thing. When I went to the studio the very first thing I said was that I wanted the dragon to be furry. That was really important to me. Pete meeting Elliot for the first time. WAS CREATING THE FUR A CHALLENGE? We went to Weta Digital in New Zealand to do the visual effects because not only are they so good at doing character work with CGI creatures but they kind of mastered fur with the Planet of the Apes films. Knowing Elliot was going to be all-digital and that we needed him to look and feel real, we felt that would be the best way to ensure that. It takes forever to remove elements and animate other elements because every single one of those strands of fur is real, in terms of what the computer thinks. But they’ve got their grooming process down really well at this point so they animate the shot, hit render and then two weeks later there’d be a shot with pretty good looking fur coming out of the other end. 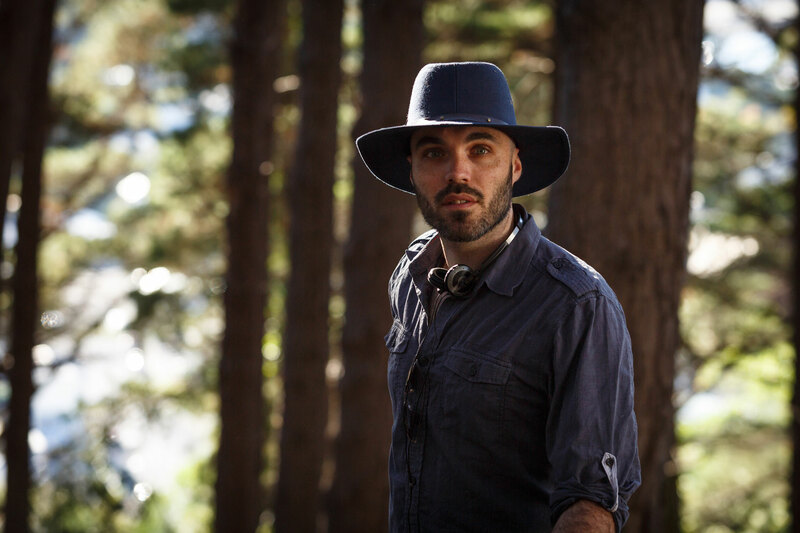 Director David Lowery on location for ‘Pete’s Dragon’. TELL US ABOUT SHOOTING THE FLYING SEQUENCES, WAS IT ALL DONE IN FRONT OF GREEN OR BLUE SCREENS? We had both actually, it would be blue or green depending on the scene, how much sky you see, the quality of the light, things like that. If you’re shooting him against a blue sky you wouldn’t use a blue screen, you’d use green. These special effects technicians in New Zealand build all these awesome rigs and then customise them. For the flying scenes, Oakes would be riding this mechanical bull-type rig. The guys build several coverings for each movie and you program it to do certain things. Then you just bring up a bunch of large fans right up in front of Oakes and turn them on. It’s tough to create that sense of flight and weightlessness and sense of falling, so we really put the machine through its paces and tried to get it to buck and move as much as possible to create the sense it wasn’t just a kid tied to one rigid post. I’m pretty pleased with how the flying turned out. 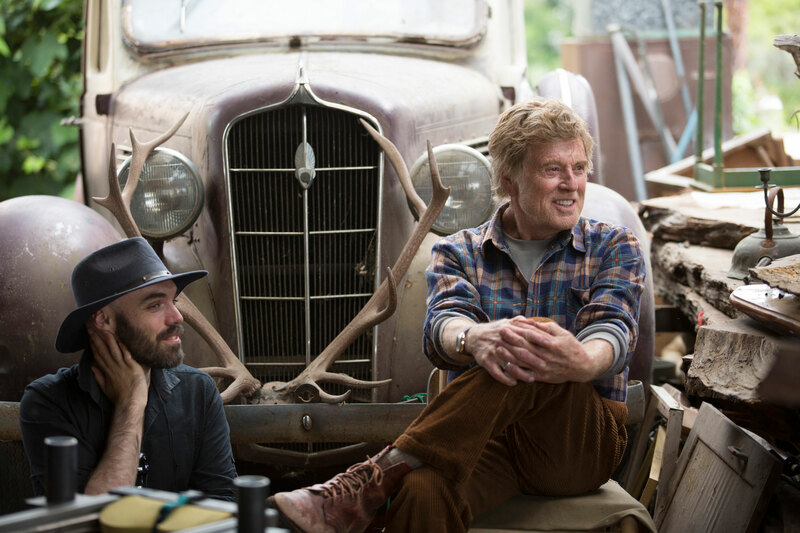 David Lowery directing screen legend Robert Redford on the set of ‘Pete’s Dragon’. ARE YOU WORRIED ABOUT ANY COMPARISONS TO THE JUNGE BOOK? It’s weird how all these similarities pop up that aren’t intentional, but when you’re making the movie you’re in a bubble, you’re just so focused on it, you can be completely unaware. I knew they were making the Jungle Book but it didn’t really cross my mind that there were going to be these similarities. So I was a little worried at first when I saw the trailer, but ultimately it’s fine. It’s a completely different movie. Beyond the fact that it’s about a feral child there are zero similarities. SINCE AUDIENCES HAVE SEEN SO MANY DRAGONS ON SCREENS AT THIS POINT, WILL SEEING WHAT ELLIOT LOOKS LIKE BE ENOUGH OF A DRAWCARD? Obviously, the Harry Potter films, Game of Thrones and The Hobbit all had some pretty impressive dragons in them, so I wanted this dragon to feel distinct and different. It’s still a dragon. You know, we found out really quickly where the design would break and not be a dragon anymore – like if we put feathers on the wings he wasn’t a dragon, but if you made bat wings he still felt like a dragon. I hope the character in itself stands out and that he’s a draw, but personally, I don’t feel a sense of dragon fatigue. They are out there but I don’t think people are going ‘we’ve got too many dragons in the movies’. 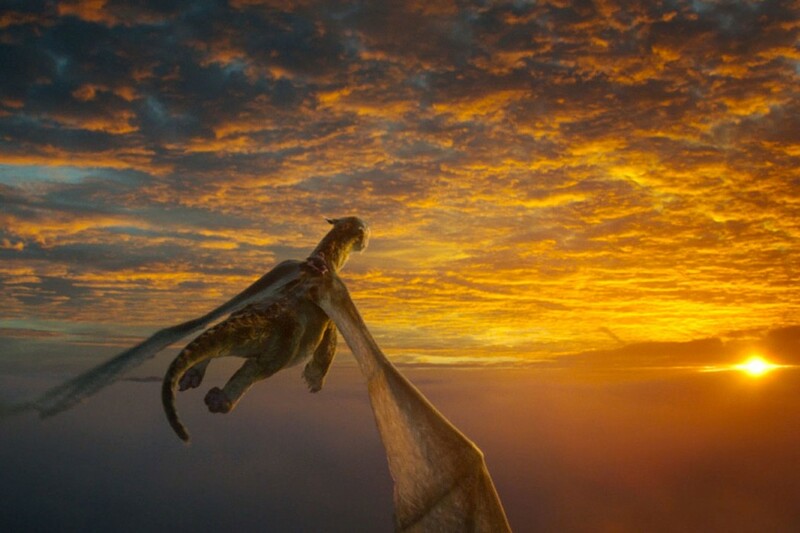 Pete’s Dragon will be screening in European and US cinemas from this Thursday, 12th August 2016. Australian cinemagoers can see the film from September 15th, with release dates set later in the year for the rest of the world. Images courtesy of Walt Disney Productions.